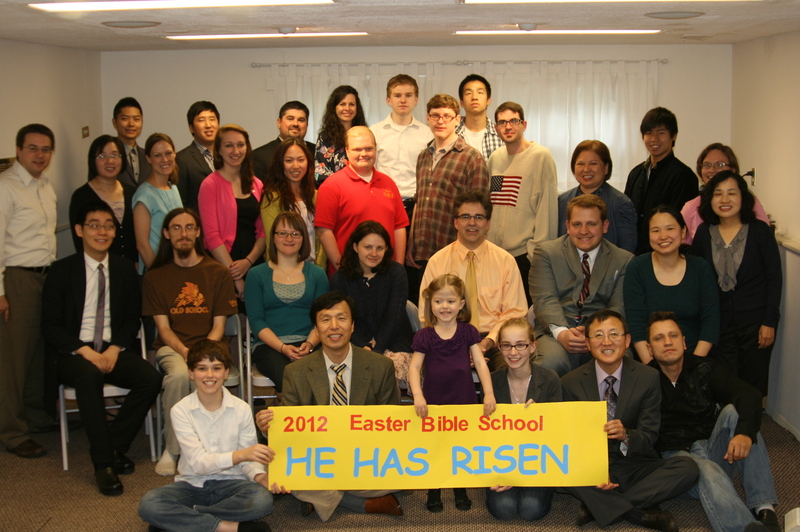 The Joint DuPage & NIU Easter Bible Conference took place at the DuPage bible house on April 13, 14, and 15th. We studied Luke’s gospel from chapter 23-24 with the title “He Has Risen!” We wanted to have an overcoming spirit this year, like Caleb. Everyone has things to do and burdens and stress but we wanted to learn how faith in Jesus shatters all burdens and all hopelessness and depression. Just like the women at the tomb, all attendants had their spirits lifted and hope in Jesus restored through the wonderful singing, prayers and messages and testimonies. We felt as if we were in heaven through wonderful co-working. As Easter is a time of new life and new beginnings, NIU and DuPage this time gave young and fresh students a chance to share the word of God and to a service presider. In the hope that they may grow to b spiritual leaders for the future ministry. On the first night NIU co-workers led the singsperation with their beautifully trained voices. Mark, Sarah, Augustine, and Jennifer. Jennifer Jesmer from NIU presided over the service and shared her graceful testimony about finding her identity in this world through Jesus. For NIU provided heavenly singsperation and special songs throughout the conference, we were truly blessed. The opening message was delivered by Pastor David Kim. He powerfully recounted Jesus’ arrest and brutal treatment, but he wonderfully shared Jesus’ testimony, “You are right in saying I am.” Jesus gave us great comfort by confessing that he was the Son of God who came to die for our sins. The second message was shared by Amanda Kender. She is a music major attending COD. In her message about how the crowds had been waiting for the Messiah but when he came the day rejected him and called for him to be crucified, Amanda shared in her testimony about her strong Christian up-bringing. She shared how her life lost control when she forgot who’s she was. But through Bible study she is being restored to the image of God’s child. Isaac Bahn shared his testimony. He felt like prisoner in church from his youth. But like Cyrene, he touched by Jesus’ cross and overcame all bitterness to love the ministry. On the second night, Paula Terova gave her heart for her first message. She really understood message of the cross and proclaimed that Jesus is Almighty God and reminded that she should trust God first based on Jesus’ sacrifice. On evening, second message is delivered by Matthew Monroe. Luke 23:46 in titled “His Last Word”, we learned Jesus’ unshakeable faith could move heart of centurion. We learned that Jesus had faith in God and committed his spirit to God. In this, Matthew challenged us to summarize our life for Christ in one sentence. Dylan COD student shared his testimony. He grew up in strong Christian family. He left his faith alone. But the Lord brought back his faith through his friend’s suffering and prayed to keep spiritual focus through the Bible Study. On day three, there were 34 people, guest including Monica Barry and Jason Lee, Augustine and Hannah Park from North Western. The opening Sunday message was delivered by Matt Cizek based on Luke 24:1-12. Through this passage, we reminded that Jesus rose again in third day to defeat power of the death. Through his uncle’s resurrection faith, Matt could overcome sorrow of his uncle’s illness. Now Matt has living faith in Jesus. The final message was delivered by Pastor Kevin from NIU based on the road to Emmaus. We learned that Jesus communicated with disciples on the road is like our journey of faith. Without hope we will despair. Pastor Kevin repented his earth bounding hope in his own ministry and like the disciples on the road, he made firm decision to place his hope in Jesus’ kingdom. 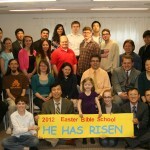 Philip Chang shared his testimony based on Luke 24:5. He is a medical student but his job is very stressful. But he learned to love unlovable patients and people in his hospital by blood of Jesus. Esther Kim shared her testimony Luke 24:7. She was bitter because her parents left her when they went to their mission field. But through Jesus’ resurrection, she could see her life in God’s point of view and how God prepared her family’s life for saving many. Throughout the great co-working of NIU and our women co-workers who sacrificially served behind the scenes we could experience the work of the Holy Spirit and have new faith in Jesus to trust our lives to him and serve him all the more.